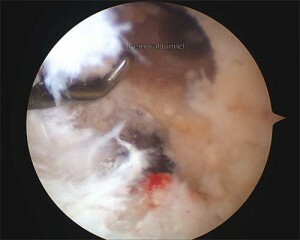 The procedure is usually performed arthroscopically (through keyhole surgery) and is aimed at replacing the deficient ACL with a graft ligament to stabilise the The procedure is usually performed arthroscopically (through keyhole surgery) and is aimed at replacing the deficient ACL with a graft ligament to stabilise the knee. Mr Hunt usually uses the medial hamstring tendons (gracilis and semitendinosus tendons) as the graft to replace the torn ligament. Occasionally it is necessary to use the middle third of patella tendon (the tendon just below the kneecap, taken with a small piece of bone from the patella and the tibia). The hamstring graft is harvested through a small incision (approximately 4 to 5cm) below the knee over the inner (medial) aspect of the shin . The graft is inserted through a drill holes in the femur and tibia so that it lies in the same position as the original ACL did before it was injured. The graft is then held with screws or similar devices that do not require removal. Most patients are able to return home on the same day as surgery or the following day. All patients will need someone to take them home and be with them on the night following surgery. In summary, whilst the wounds are wet – keep them dry and when the wounds are dry, you can get them wet! Surgery is followed by a prolonged course of physiotherapy. This requires a commitment to undertake this rehabilitation in order to achieve the best possible result (at least half an hour per day for 6 months). It is vitally important to stay within the post-operative activity restrictions an physiotherapy guidelines to avoid damaging stretching your reconstructed ligament. Driving: when you can walk without crutches or a limp and be in control of your vehicle (about 3-4 weeks). Infection can occur with any operation. Special precautions are taken during surgery to diminish this risk, however, the risk still exists but there is <1% chance of developing a serious infection (major wound breakdown, septic arthritis or osteomyelitis). Deep vein thrombosis (DVT/PE) (blood clots) can also occur as with all operations (<0.2% of a serious clot). This does pose a definite but miniscule risk to life (<1:10000). Re-rupture can happen if excessive force occurs to the knee in the early post-operative period (performing the wrong activities too early). Rupture can also occur at a later stage by another injury (4-5%). 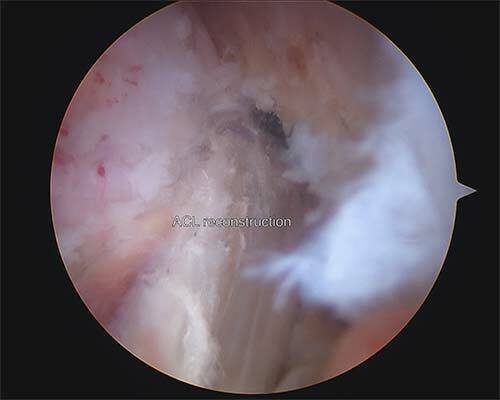 If this occurs then the options remain the same – that is to either live around ongoing instability symptoms or to undergo revision ACL reconstruction.